Today was Cam's last regatta, this time in Pittsford. It was a beautiful, warm weekend for the race, a much needed reward after all the terrible weather we've had to endure for this sport. His boat made it to the finals, but was beaten in the end by McQuaid. For all my complaining, the end is bittersweet. By now you've probably figured out that the world did not end on Saturday. Maybe for some, metaphorically, it did end, but in general most of us are still physically "here." Oh well, there's always October 2011, and, if that doesn't work out, December 2012 to look forward to - or to dread, depending on your point of view. This afternoon we had a surprise visit from my OTHER nephew, Anthony (or, Tony, as he is now known), who stopped by after coming north from Raleigh, NC, for a wedding shower/bachelor party for his friend Josh, who is originally from Fairport. It was so great to see him! I'm trying to convince him to come up again for Cam's graduation celebration. The kids always have such a good time when they get together. Congratulations to my awesome nephew, Andrew Walldroff, on his graduation from SUNY Potsdam today!! While he still has his student teaching semester in the fall, he's mostly done and that's good enough for me. Good luck, Mr. Woof Woof! How could I have not posted about the results of last week's NYS Scholastic Regatta in Saratoga Springs? Oh well, better late than never!! Cam's crew career is winding down as we head into the final stretch for spring regattas. Last weekend he headed out on Friday afternoon for Saratoga, and we followed (just for the day) on Saturday. OF COURSE, the forecast, after a beautiful, sunny week, predicted rain. The good news is the rain held off until 3:30pm on Saturday, by which time Cam's boat was getting queued up for the semi-final race, having come in fourth out of six for the qualifying race. For this regatta, Cam, who usually coxes the C boat, was moved up to the B boat (there are the A, B, and C boats) as the regular coxswain, Kevin, stayed behind to attend the senior ball. Happy Birthday, Fabulous B@ker Blog! 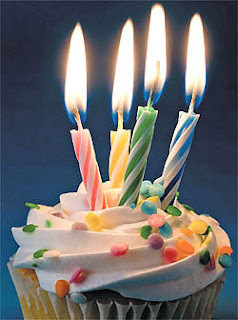 Happy 4th Birthday, to You! The End of Days, again. Have you heard? 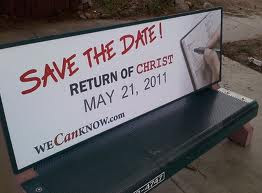 The world is going to end (again) this coming Saturday, May 21 (or is it October 21...or is it sometime in 2012...). That means I'd better get busy; I have a lot to do in the next six days, like:Go on that world tour I've always dreamed of (talk about jet lag)Go on a cruise (it will have to be just a three-day cruise)See that old boyfriend one last time (probably not going to happen since I'm not even sure where he lives now)Finish all my projects at work (well, I suppose if the world is going to end I should probably just quit tomorrow anyway)See the kids happily on their own, married with families (this is probably not going to happen in the next six days)Get the newest iPhone (unless my current one can take me through until next week)So, so much moreIt looks like Annalisse will only be able to enjoy two out of the three productions of her play next weekend since the third performance is at 7:30pm, 1 1/2 hours after the world ends. For the first time in three years we were home for Mother's Day this year (the last two years we've been in the cold an rain at the Saratoga Regatta). It was wonderful! The weekend could not have been more beautiful, and there were lots things going on, starting with Friday night and Annalisse's second-to-last Downstage show for the year. The kids continue to amaze me with their talent! It's been amazing experience for her this year!! 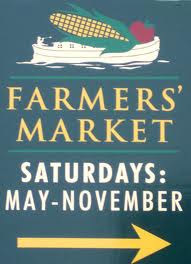 There is a sure sign of spring on the horizon: the Fairport Farmer's Market starts up again this weekend!! A nice morning walk with the pup! Sticky buns! Flowers for the yard and herbs for the garden! Although it's tempting to say "we made it" (through the long, dark winter) it still feels like we've a ways to go with unrelenting rain, gray skies and chilling cold. We have to take all the signs of spring that we can get...my sanity depends on it! !